I have recently become interested in the origin of hamsters. This came about because of a conversation over coffee with my friends Nicole and Jennifer. I mean, think about it. Have you ever seen a wild hamster? Are they just genetically engineered from some other types of rodents to be pets? Did we capture all the wild hamsters left in 2001 and force them to do the hamster dance on our computer screens for our own amusement? So I went where all good sleuths go: Wikipedia. There I found a plethora of information about hamsters. 1. They were first described scientfically in 1839, but it wasn’t until 1930 that researchers were successfully able to breed and domesticate hamsters. 2. They originally came from Syria. 3. Wild hamsters (they apparently exist!) burrow in the ground during the day to avoid predators. 4. 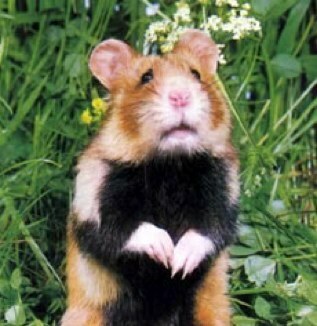 Wild hamsters (i love that phrase) are considered a “vulnerable species” on the scale of endangerment. Thus begins my campaign to save the wild hamsters. Because, let’s face it, now that I know that the phrase “wild hamsters” is legitimate, I don’t ever want it to be inapplicable or cease to exist. So there you have it, folks. Things you didn’t know about hamsters. You can find out more fun facts about hamsters and their eating habits here. NOTE: This is a real picture of a wild hamster that I found on the internet. Look how sad he is because he is vulnerable! Also probably because a giant human is taking a picture of him in the daytime, where he is obviously exposed to predators. Save the (sad) wild hamsters!